Emergency Dentists USA offers a convenient listing of Baton Rouge emergency dentists who are standing by to treat your dental emergency with care and consideration. From 24-hour access to a wonderful emergency dentist to after hour dental clinics that offer the emergency care that you need on a schedule that suits you, Emergency Dentists USA has the dental clinic for your dental emergency. Call our 24-hour dental emergency hotline to speak with a live operator who can assist you in choosing a great Baton Rouge dental provider and even help to make an appointment that fits your schedule. Great website, glad I found it when I was having a massive toothache. There was a lot of helpful information on common dental emergencies on it and I was able to quickly find a local dentist that could help me out. Finding a 24-hour emergency dentist in Baton Rouge, Louisiana does not have to be a hassle, especially if you are suffering from a common dental emergency. Emergency Dentists USA has the right Baton Rouge emergency dentist for your dental problem. Our providers offer appointments that suit your schedule and convenient locations that are near your hotel or home. Baton Rouge does have a variety of great hospitals with 24-hour emergency departments that do not require an appointment for dental services. Dr. Wade Gardner at Cosmetic and Family Dentistry on Bluebonnet Boulevard has a 24-hour hotline that leads directly to his cell phone for after hours emergencies. Dentists who offer after-hours appointments are definitely a bonus. Trans Dental Care has weekend hours on Saturdays until 12 p.m. and Grand Family Dentistry is open until 6 p.m. on Mondays. Emergency Dentists USA makes choosing a Baton Rouge emergency dentist a breeze with our convenient listings of friendly and reliable Baton Rouge dental clinics. Simply scroll through our comprehensive listing of emergency dentists and choose the dental clinic that suits your needs or your particular schedule. Use our 24-hour dental emergency hotline to connect with a live operator who is ready to help you select an emergency dentist that fits your needs. Description: Call to be connected with the perfect dentist for you. 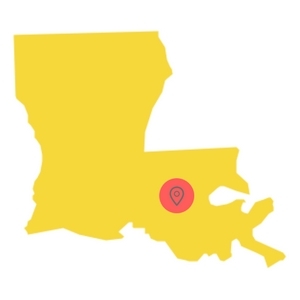 Baton Rouge is a large city and we have the connections to find a dentist to fit your needs, and can get you an appointment immediately. You can get emergency dental help in Louisiana fast. Description: Dr. Gardner’s office is open with regular Saturday dental hours and if things go wrong for you on a Sunday, his answering machine rolls over to his cell phone so he can stay abreast of what urgent matter may require immediate assistance. Dr. Wade wants you to call if you are in experiencing some kind of dental problem. All in all, a great choice for emergency dental care in Baton Rouge, Louisiana. Description: Bluebonnet Dental Care is an excellent choice for a Saturday dentist as they have hours from 8 AM to 2 PM. Their staff is excellent dealing with emergencies as well as routine care, overall a great choice when you’re looking for an emergency dentist in Baton Rouge. Description: The staff at Trans Dental Care is standing by to help the good people of Baton Rouge with any dental needs you may run across. They are open weekdays until 5PM, and are also open on Saturdays from 8AM until 12PM, a real bonus for those who lead very busy lives, and have their schedules jam-packed during the week. You may be facing something serious such as the need for an extraction, or just a routine cleaning, and can trust the folks at Trans Dental Care for Either. Description: Grand Family Dentistry is a Baton Rouge clinic that is there to serve you and your family no matter what type of dental needs you are facing. This is a weekday clinic that stays open Mondays until 6 PM. 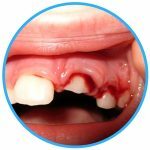 You may need routine work such as check-ups, or have the need for something serious such as making sure that you are not developing an abscess: this is a clinic with an excellent reputation and very knowledgeable staff. Try to arrive at least 15 minutes prior to the dental appointment to complete any paperwork that is necessary. Use this time to ask any questions that you might have regarding your treatment options. Most emergency dentists offer routine care like cleanings and fillings along with more complicated procedures like dental implants or tooth repairs. Gather your health records and any recent dental x-rays or examinations to bring with you. This will help your new dentist to choose a treatment plan that is best for your dental emergency. Let your new Baton Rouge emergency dentist know how you plan to play for your dental services. Most dental clinics accept cash, credit cards, personal checks and some even offer low-interest payment plans for larger dental procedures. Make sure you know if your insurance is accepted at this dentist. Choosing an in-network dentist will help to save you money when the time comes to pay the dental bill. Bring a list of your current medications with you to the dental visit. Emergency Dentists USA provides a comprehensive listing of Baton Rouge emergency dentists who are standing by to help to relieve your painful toothache or fix that broken tooth. Common dental emergencies include soft tissue injuries to the mouth, tongue, and gums along with objects that are caught between the teeth. Other emergencies might include a chipped or broken tooth or a tooth that is knocked out. 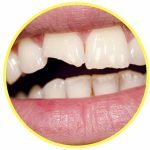 A chipped or broken tooth is a common dental emergency. If you are able to find the portion of the tooth that has broken, rinse it carefully with plain water. Bring the portion of the tooth with you to visit your Baton Rouge emergency dentist as soon as possible. Use a cold compress outside of your mouth to reduce pain and swelling of the lips or cheeks. A small piece of moistened gauze or a moistened tea bag can be placed against any area that is bleeding to control the flow of the blood. Use gentle pressure to apply the gauze to the bleeding area and visit your dentist as soon as possible. Knocked out teeth are a common dental emergency that could include other bodily injuries like a concussion. In the case of a knocked out tooth from a fall or sports injury, visit your hospital ER as soon as possible. If you are able to find the tooth, grasp it only by the crown and avoid touching the roots. Rinse the tooth with plain water and place the tooth into a small container of milk or Save-a-Tooth. Use a cold compress to relieve pain and swelling outside of the mouth. Visit your Baton Rouge emergency dentist as soon as possible to see if the tooth can be replaced or repaired. Objects that are caught in the teeth can become very painful. It is important to rinse your mouth with water and floss the area gently to try to remove the object. Do not use a pin or other sharp object to probe between the teeth as this can cause damage to the gum and the teeth themselves. Never place aspirin or any other painkiller between the cheek and gum as this can cause chemical burns to the soft tissue of the mouth. Visit your Baton Rouge emergency dentist as soon as possible to ensure that the object is removed correctly. You might need an emergency tooth extraction if your tooth has decayed to the point that your dentist can no longer repair the tooth or if your tooth is crowding other teeth in your mouth. It is important to have the extraction accomplished as soon as possible to ensure that complications can be avoided. Your dentist usually begins the procedure with an x-ray and examination of the tooth. A general or local anesthetic is chosen to help you remain comfortable during the procedure, and a special dental tool is then used to pull the tooth from the gum. The gum is then stitched closed with a type of suture that dissolves over time. A small piece of gauze is used to cover the gum and absorb any blood. Full healing usually occurs within one to two weeks. While you are waiting for your gums to heal, it is important to take any medications as they are prescribed. Avoid drinking from a straw or eating hard foods for the first few days following the extraction. Also avoid smoking or drinking alcohol until the gum is completely healed from the extraction. Visiting the emergency room of a hospital is an excellent idea if your dental emergency begins with a car accident, fall, or a sports injury. Any time there could be injuries to any part of your body other than your teeth, a hospital emergency room physician should be consulted to ensure that you are in good health. Visiting the hospital emergency room for a toothache or a lost filling could end up being a costly decision. Most emergency rooms are not set up to treat dental emergencies and might not even be able to help with your particular problem. Your Baton Rouge emergency dentist can handle any of the common dental emergencies more quickly and generally at a lower cost than most hospital emergency rooms. Visiting the dentist rather than the hospital emergency room could save you money and time when it comes to handling that painful dental emergency. When selecting a new dentist, it is important to ensure that he or she is certified and licensed for the state of Louisiana. You can use the American Dental Association’s website to find current information on licensing. You can also research your new dentist on the Louisiana Dental Association website to find great information regarding your new dentist and dental care advice.